The Oreninc Index picked up slightly in the week ending November 2nd, 2018 to 23.68 from 20.40 a week ago as although financings remain in short supply. Gold had a volatile week with its growing strength showing through and shaking off strong US jobs growth numbers, as the US heads into the mid-term elections. US non-farm payrolls in October were up by 250,000, much more than expected, whilst wages grew at their fastest pace for nine years, an annual rate of 3.1% in October and the unemployment rate holding steady at 3.7%. On the geopolitical front, there is increasing noise out of Washington that the Trump administration about the possibility of entering trade negotiations with China, which could ultimately see the trade tariffs it has imposed being removed. In Europe, the United Kingdom and European Union seem no closer on agreeing the terms for the formers exit from the latter with a few short months to go before the exit date. On to the money: total fund raises announced got a boost to C$53.9 million, a two-week low, which included no brokered financings and one bought-deal financing for C$3.5 million, a two-week high. The average offer size increased to C$3.2 million, a six-week high, whilst the number of financings increased to 17, a two-week high. Gold closed at US$1,232/oz, a dollar down from a week ago having recovered from a mid-week dip to US$1,214/oz. It is now down 5.37% this year. The US dollar index also increased again to 96.54 from 96.36 last week but down from its mid-week high of 97.13. The van Eck managed GDXJ pulled back again and closed down at US$28.06 from US$28.21 a week ago. The index is down 17.78% so far in 2018. The US Global Go Gold ETF saw growth as it closed up at US$10.87 from US$10.65 a week ago. It is now down 16.45% so far in 2018. The HUI Arca Gold BUGS Index also closed up at 149.44 from 144.65 last week. The SPDR GLD ETF saw another week with its inventory increasing to 759.06 tonnes from 749.64 tonnes a week ago. In other commodities, silver added a cent as it closed up at US$14.71/oz from US$14.70/oz a week ago. Copper added a few cents to close up at US$2.80/lb from US$2.74/lb last week. Oil continued its slide as WTI again closed down at US$63.14 a barrel from US$67.59 a barrel a barrel a week ago. The Dow Jones Industrial Average reclaiming some of the ground it lost in recent weeks closing up down at 25,270 from 24,688 last week. Canada’s S&P/TSX Composite Index followed suit as it closed up at 15,119 from 14,888 the previous week. The S&P/TSX Venture Composite Index also saw a gain as it closed up at 651.35 from 643.58 last week. Number of financings increased to 17, a two-week high. No brokered financings were announced this week, a three-week low. One bought-deal financing was announced this week for C$3.5m, a two-week high. Total dollars grew to C$53.9m, a two-week high. Average offer size increased to C$3.2m, a six-week high. Osisko Mining (TSX:OSK) entered into a private placement agreement with la Caisse de dépôt et placement du Québec through which la Caisse will acquire 9.3 million shares @ C$2.70 for gross proceeds of C$25.0 million. Excelsior Mining (TSX:MIN) entered into an agreement for a US$75 million project financing package. The US$75 million project financing package will be provided by Triple Flag Mining Finance Bermuda and consists of a US$65 million copper metal stream and concurrent US$10 million private placement. The US$10 million private placement will be 13.8 million shares @ C$0.95. This may be increased up to US$20 million dependent upon Greenstone Resources deciding to exercise its pre-emptive right. The funding plan will enable Excelsior to transition the Gunnison copper project in Arizona, USA into America’s next new copper producer. Excelsior Mining (TSXV:MIN) opened a C$12 million offering on a best efforts basis. 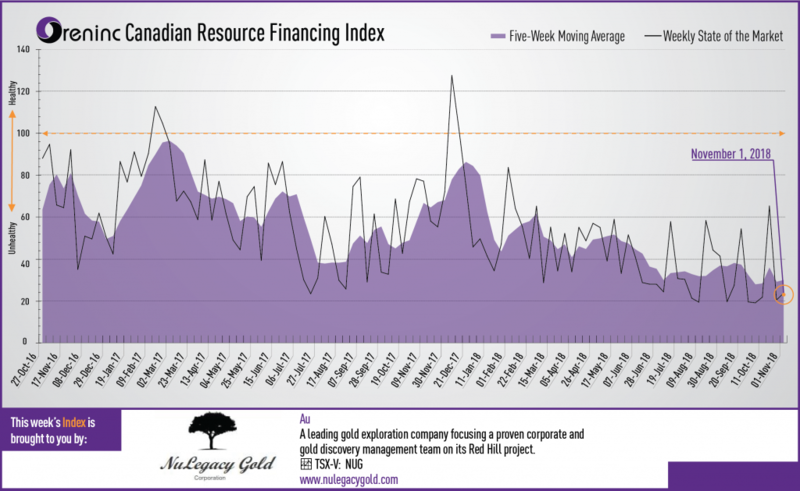 Great Bear Resources (TSXV:GBR) opened a C$5 million offering on a bought deal basis. MGX Minerals (CSE:XMG) opened a C$3 million offering on a best efforts Each unit includes half a warrant that expires in two years. Harte Gold (TSX-V:HRT) closed a C$95 million offering on a best efforts basis. Calibre Mining (TSX-V:CXB) closed a C$03 million offering on a best efforts basis. Each unit included a warrant that expires in five years. Plateau Energy Metals (TSX-V:PLU) closed a C$68 million offering on a best efforts basis. Each unit included half a warrant that expires in 18 months. Cypress Development (TSX-V:CYP) closed a C$01 million offering on a best efforts basis.